Fort Worth Police Department SWAT officers are the first in the country to deploy a new, non-lethal weapon that uses a rope to lasso a person’s arms or legs. Part Spiderman, part Batman, the gadget is brand new to police. SWAT officers used it just last week on an armed suspect, a man who had barricaded himself in a house. Officers used gas to get him outside but they were afraid he would run so they used the rope device, which is called BolaWrap. "And his immediate response was to grab it and by that time our take-down officers were on top of him, placed him on the ground safely and took him into custody,” said Officer Donald McCreery. BolaWrap is made by a Las Vegas company called Wrap Technologies. They're marketing it to police departments across the country. The BolaWrap "gun" fires an 8-foot bola-style Kevlar tether that entangles and restrains a person in less than a second. At the end of the rope is a small hook, like a fish hook, that attaches to the person's clothing. "We're always looking for less lethal options and ways to de-escalate situations and bring people into custody without injuring them if we can," said SWAT commander Lt. Todd Plowman. 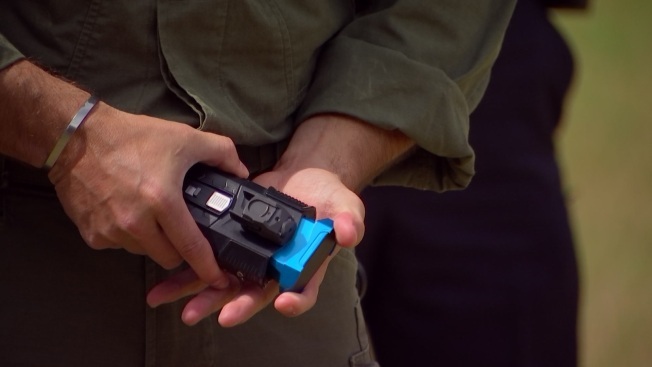 "There is no less-lethal option that is going to be perfect in every scenario. This is just more tools that we can use." For now, only the SWAT team has BolaWrap but the department may consider giving the device to other officers later.